It seems that after my batch of mediocre chick lit I’m now enjoying a run of greatness that the genre has to offer. 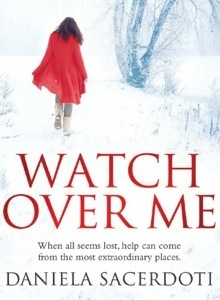 Watch over me by Daniela Sacerdoti is a magical and beautifully written book. After the first few pages I had already made a mental note to read the section again at a later date because it’s so well written, almost poetic. The beautiful writing flows through out the whole book making it a joy to read. The story itself ensured that I didn’t want to put it down. It centres around Eilidh who is back to Scotland, what she remembers as home, after 10 years of failed attempts at pregnancy and the ending of her marriage. The descriptions of pregnancy and small children are lovely and the book should come with a disclaimer that says “Will make you broody”!. I’ll be reading more from this wonderful author. Next up on my list is the latest Dorothy Koomson, The Rose Petal Beach. I’ve loved pretty much all her books so am hopeful that this will be another great one.